After leaving the Army in 2003, I went into a deep depression. Alcohol consumed my life and I ballooned up to 255 pounds from my exit weight of 215 pounds. I stopped drinking in May 2006, got married, and thought I was fat and happily wed, but I was wrong and killing myself slowly. I was a member at Gold&apos;s Gym but only went through the motions without a diet plan, which led to my highest weight of 316 pounds. My annual VA checkup in 2011 said I was prediabetic and had two slightly bulging discs in my back. I witnessed my dad struggle with diabetes and couldn&apos;t imagine my life that way, so I decided to change. My wife wasn&apos;t supportive of my decision, which caused lots of stress and led to our divorce. The divorce added fuel to my fire. I had to prove to myself that I was worth the hard work and sacrifices I was making. I met my fiance Amy Colvin at the gym and to this day we still have date nights at the gym. This continued support helped me through two-a-days and low-carb days, as she understands the sacrifices needed to shred fat. I started hitting the gym a minimum of once per a day, five times per week and consumed roughly 1,900 calories per day. My diet wasn&apos;t completely healthy, but the weight was coming off, so I was happy. After losing 100 pounds, I entered my first physique competition in October 2012 at The FitSpace Live & Jenny Worth NPC Tallahassee Championships and placed second out of two contestants. I didn&apos;t look in shape but was proud of my weight loss at that point. Then I met my coach, Jason Giardino. I continued to work out but wasn&apos;t sure I wanted to compete again and expose my flaws. they asked him to join in 2011! Coach Giardino took me under his wing after another disappointing showing at the NPC Southern USA in June 2013. I started dieting and weight training with Coach Giardino in August 2013, which brought me to my current physique. Coach Giardino introduced me to the Absolute Fuel family and now I&apos;m on the National Demonstration Team as a result of my transformation using their product. Training with 2012 "Mr. Tallahassee" and 2013 BodySpace Spokesmodel Finalist Jareem Maduro also helped me get to where I am today. My diet plan, constructed by Coach Giardino, gave me more meals and smaller portions eaten two hours apart. I don&apos;t get tired of eating the same foods constantly because I used to eat fast food every meal with horrible results. Now I eat healthy with positive results. Cardio and abs are done almost every day. "Ultimately, it&apos;s about how bad you want it and the sacrifices you&apos;re willing to make." Juggling friends, family, and a love life around my training is challenging, but fitness and healthy living is my lifestyle and those in my life understand and respect it. I&apos;m currently training to earn a spot at nationals and then earn my pro card in men&apos;s physique. I want to inspire and motivate others who accepted obesity as their fate and show them if I can do it, so can they. Ask for help! We didn&apos;t teach ourselves in grade school. Someone more knowledgeable on the subject taught us. I tried it my way and failed to reach my goal. I&apos;m not saying it can&apos;t be done by yourself, but a trainer helps you train and eat correctly from the start. Ultimately, it&apos;s about how bad you want it and the sacrifices you&apos;re willing to make. 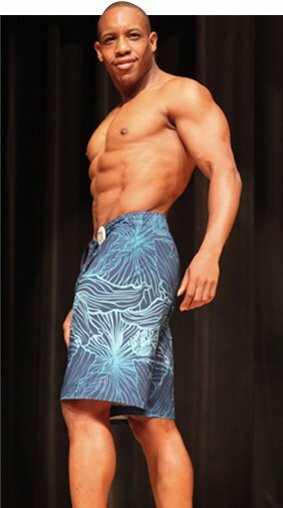 Bodybuilding.com helped me tremendously with a great selection of supplements and helpful articles. The camaraderie between BodySpace members who are always supportive and informative helps immensely!